Perhaps you've seen the Animals addon adds some realistic animals: tigers, lions and zebras. So it's time to large mammals. 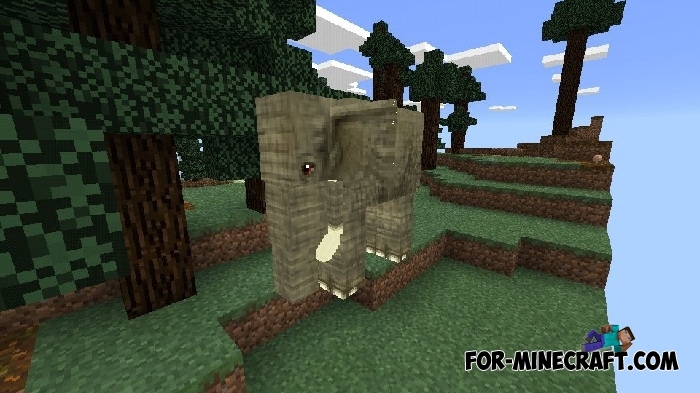 Oddly enough, but the Elephant addon adds elephants several times bigger than you in Minecraft Pocket Edition. Elephants eat grass (As conceived by the creator) and walk around the world. This mammal has large tusks and is neutral to the player and other animals. If you install the addon mentioned above then the lions will attack elephants as in life. Elephants spawn everywhere apart from other worlds and can breed. Baby elephants are very weak but you can tame and raise any animal. To do this feed it with sugar which replaces sugar cane. Like any other animal, put a saddle on an elephant (it has a new texture especially for elephants) and can ride instead of the usual run. 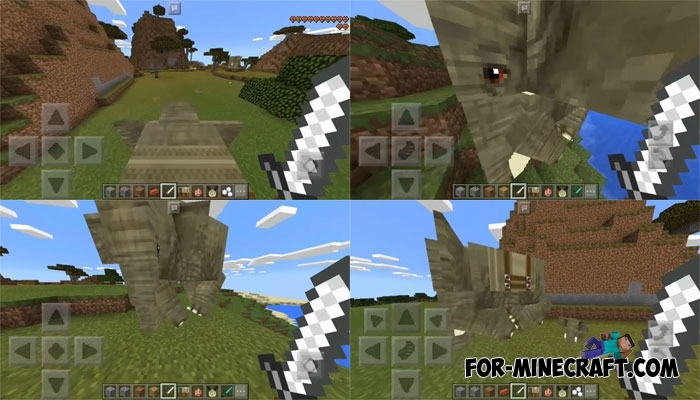 To change the direction use an iron sword. What a tamed animal lives without a name? Create a nametag and come up with the name of your pet, eg Dambo. This is just one kind of animal but at least you'll be pleased that you are surrounded by these animals. Start the game and activate the downloaded files in the world settings or when you create it.